Taking the stress out of the stock market, this no-nonsense guide walks you through all the steps to trade with authority—and takes your portfolio to exciting new heights. Whether you're an investor looking for a clear guide to successfully trading stocks in any type of market, or an investor who has experience trading and are looking for new, proven methods to enhance the profitability of investments, you'll find a proven system for eliminating doubt, decreasing risk, and, ultimately, increasing return. 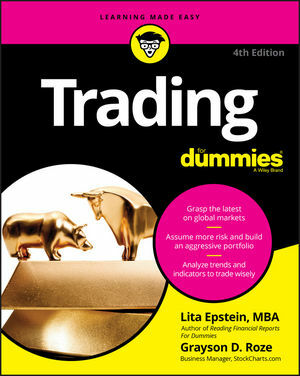 If you're in need of basic strategies and stock valuation methodologies that let you make smart trading decisions, this book has it all! Lita Epstein, MBA, is the author of more than 35 books, including Bookkeeping For Dummies and Reading Financial Reports For Dummies. Grayson D. Roze has worked in the financial services industry for StockCharts.com since 2012. He now serves as a business manager at the company. He is the author of Tensile Trading: The 10 Essential Stages of Stock Market Mastery.